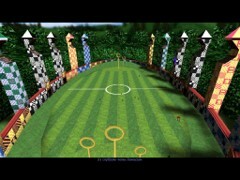 As the Gryffindor Seeker, catch the Golden Snitch and help defeat the Ravenclaw team. 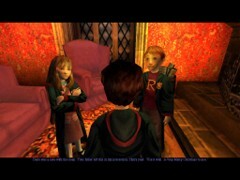 [3.22] Exhausted from their encounter with the Troll, Harry, Ron and Hermione returned to the Gryffindor common room and discussed the strange goings-on at Hogwarts. Harry suspected that someone had released the Troll to distract everyone so that they could get into the forbidden corridor. But there wasn’t much time to think about who was behind this, especially since Harry was busy preparing for the second Quidditch match against Ravenclaw. Welcome to Quidditch, I’m your commentator, Lee Jordan. 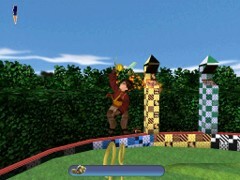 It’s basically the same kind of match like at the end of Level 2: Harry has to catch the Golden Snitch on his broomstick. Careful for these Bludgers, Harry may get badly hurt! Thanks to Harry’s skill as a Seeker, Gryffindor won the Quidditch match against Ravenclaw. 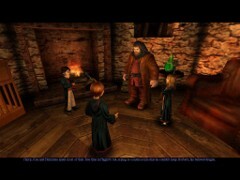 Harry, Ron and Hermione spent most of their free time in Hagrid’s hut, trying to convince him that he couldn’t keep Norbert, his beloved Dragon. It’s an Invisibility Cloak, they’re very rare. There was a note with the cloak: Your father left this in my possession, Harry read. Use it well. A very nice Christmas to you. 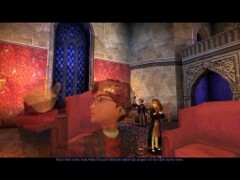 Harry tried on the Cloak while Ron and Hermione helped him prepare for the climb up the tower. Hermione: Be careful, Harry. You can’t stay invisible while you cast spells. Filch might see you!